Julia promises patrons empanadas "baked with love." Julia's Faithful -- tired businessmen, drunkards, broke college students and gourmets -- make the pilgrimage to her Dupont storefront nightly. Lacquered yellow and buzzing with empenadadores at 3 a.m., Julia's Empanadas is not hard to spot. But if the bright lights and hues don't get you, don't worry -- the aroma of spices and freshly baked dough will stop you dead in your tracks and direct you to the promised land. At least that's what happened to me and my friend Rachel on the hallowed Thursday night we discovered 'Mama Julia.' We walked out of the cold and Rach, ever the health nut, looked longingly at the pastries displayed at the counter. Alfredo understands what's up and assures us they're healthy. "Julia is very picky about her food," he said. "Everything has to be kosher, everything has to be fresh ... We only make with olive oil." And they do taste pretty healthy, but not in the bad cabbage-flax soup way. 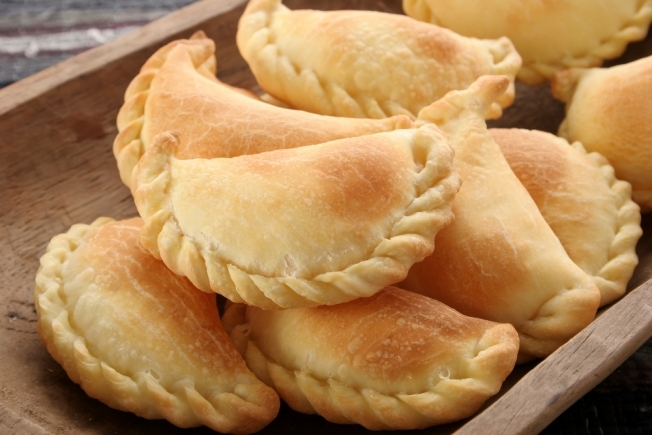 The pastry dough is delicate and slightly flaky, filling but not heavy and oily like empanadas and their counterparts (calzones, knishes, and samosas) usually are. Fillings are indeed fresh and range from simple spinach and cheese to more exotic ground and chopped beef, onion, raisins, hard-boiled egg and ripe olives. Although savory empanadas are the favorite here, do yourself a favor and try a fruit empanada -- filled with peach and guava, pear and almond, pineapple and coconut, and strawberry and cream cheese -- or their homemade rice pudding. Also, a little tip: The Chilean-style beef is a sure-fire cure for a hangover ... at least that's what I hear.